Bright, delicate and satisfying, the cuisine of Vietnam is absolutely delicious due to the wonderful contrasts this cuisine contains: sour favors are balanced by salty ones, and sweet notes are answered by a little heat from ground pepper and chillies. Nancie's easy and expert recipes will help cooks make an array of traditional dishes with widely available ingredients. There are speedy stir-fries, vibrant salads, and soothing soups, along with numerous recipes for cooking meat and seafood on the grill. Whether it's Curry Chicken with Sweet Potatoes and Lime-Pepper-Salt Dipping Sauce or Shaking Beef with Purple Onions and Watercress, or Speedy Shrimp in Caramel-Chili Sauce cooks will soon be enjoying an array of authentic and classic recipes that are fast enough to prepare during a busy work week. Delicate, rice-papered wrapped Summer Rolls with Shrimp and Mint can be party fare or the perfect lunch. And of course, no Vietnamese meal would be complete without Warm Banana-Coconut Pudding with Tapioca Pears finished with an iced Vietnamese Coffee. 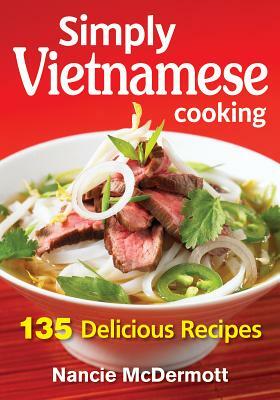 With extensive information on ingredients, substitutions, and time-saving techniques, along with suggested menus, anyone can cook simply sumptuous Vietnamese food in their home kitchen in no time. Nancie McDermott is an expert on the food and culture of Thailand where she lived for 3 years as a Peace Corps volunteer. She has traveled extensively throughout Asia and has written 10 cookbooks, including 300 Best Stir-Fry Recipes. She is a frequent guest chef on television and radio and also writes for newspapers and magazines and lives in Chapel Hill, North Carolina.